With fruit at work as a wellness initiative and as an alternative to unhealthy office snacking, you can have more energy and be more productive while you are at work. We select only the finest seasonal fruits in order to deliver fresh fruits to your workplaces. HR Managers can introduce our program fruit at work in order to encourage a normal and healthy attitude among the employees. When you eat fruit regularly, it reduces the risk of illness and grows self-esteem. 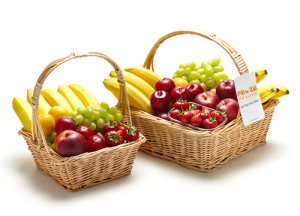 Providing free fruit to your staff can also show them that you value their position in your company and really care about their health and well-being. By having the option to reach out and grab an apple or a banana for an afternoon snack, means that the employee will be content and focused. Furthermore, it is often possible to eliminate or at the least to reduce unhealthy eating. A fruit at work allows your staff to benefit from the natural vitamins and minerals in fruit, which results a constant and sustained energy release. When people eat healthy, they benefit from a reduced risk of disease and greater immunity, which obviously reduce absenteeism. By introducing fruit into the office can benefit everybody in your business, from the smallest to the highest. When your staff is happy and healthy, they give off a radiating energy which then passes onto the customers they are dealing with. 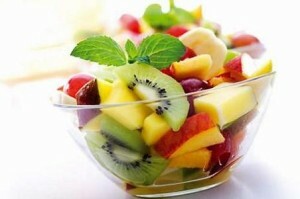 Thus, with fruit at work, it can be an advantage easily obtained by the company. Dealing with customers is sometimes demanding work. By offering fruit at work to your employees, you encourage healthy eating at work and give staff the energy to shine all throughout the busy workday. By fostering a healthy workplace, a fruit at work will increase productivity and reduce absenteeism rate among your empoyees. It’s as simple as this: Look after your staff and they’ll look after your company! It turned out that a fruit at work keeps and attract qualified, good quality, which is a concern for any company, whether large or small. 7500 varieties of apples are grown throughout the world. Apples are a great source of the fibre pectin. One apple has five grams of fibre. Bananas are a good source of vitamin C, potassium and dietary fibre. When you compare it to an apple, a banana has four times the protein, twice the carbohydrate, three times the phosphorus, five times the vitamin A and iron and twice the other vitamins and minerals. One orange supplies a healthy dose of Vitamin C, which plays an important role in cancer prevention, healthy blood circulation and wound healing. Oranges are a good source of the crucial B-vitamin and folic acid, which is essential in preventing birth defects and fighting heart disease. Oranges provide more than 7% of the Daily Value for potassium, which is needed for proper fluid balance. Oranges, as well as other fruits, contain pectin, that helps to reduce blood cholesterol levels. Oranges are high in antioxidants, which neutralize the effects of free radicals, unstable oxygen molecules in your body, believed to cause aging and some diseases. Kiwi Fruit is actually native to China and were brought to New Zealand by missionaries in the early 20th Century and were originally called Yang Tao. Kiwi Fruit is the most nutrient dense of all the major fruits. Nutrients most commonly associated with Kiwi Fruit are Vitamin C or beta–carotene. Kiwi has more vitamin C than an equivalent amount of orange. Kiwi is a good source of the important antioxidant – Vitamin E. This combined with Vitamin C, makes Kiwi able to provide free radical protection on all fronts. Kiwi also has a good source of the minerals: potassium, magnesium, copper and phosphorous. Kiwi Fruit is high in fibre. Pears are an ideal weight loss food, 98% of their energy is from carbohydrates, which contain half the calories of fat. Pears are rich in pectin, a soluble fibre which helps the body to eliminate cholesterol and also protects against environmental toxins. Pears are an excellent source of dietary fibre, vitamin C, copper and vitamin K.
Pears also have good sources of the B complex vitamins and also contain vitamin C. In addition they also contain small amounts of phosphorus and iodine. Pears help to lower cholesterol. Nectarines are a great source for vitamin A and various phytochemicals that are good for your eyes and joints. Nectarines are low in fat, saturated fat free, sodium free, cholesterol free and a great source of vitamin C.
Peaches are low in calories and are a good source of vitamin A, phytochemicals and fibre. A medium peach has 465 IU of vitamin A to combat the effects of aging. Other benefits include vitamin B, folic acid, vitamin C, calcium, fibre, potassium and a little zinc. The beta carotene found in peaches also helps build a strong immune system. Mandarins are original from China and were named after the officials of the Imperial Court. Mandarins are an excellent source of vitamin C, a good source of B vitamins, low in calories and a good source of fibre. There are two major types of plums – European plums and Japanese plums. Plums have some fructose and sucrose, but most of the sugar is in the form of glucose. Plums contain moderate amounts of vitamin C and small quantities of other vitamins and minerals. Plums supply moderate quantities of dietary fibre, mostly soluble fibre. Grapes were first cultivated over 8000 years ago. Grapes have a high sugar content, half as glucose and half as fructose. Grapes contain some dietary fibre and vitamin C.
Grapes also contain adequate amounts of potassium and vitamin A and are low in sodium. A Strawberry has approximately 200 seeds on it. Strawberries grow wild all over Europe and have been cultivated for the last 700 years. Strawberries contain fructose and glucose. The seeds on a Strawberry provide a good source of dietary fibre. Strawberries also contain some folic acid and one of the B complex vitamins. Mangoes are known as the King of Fruits. A mango tree doesn’t produce fruits until it’s about four years old. Mangoes are picked when mature and more green than yellow. Mangoes belong to the same family as the cashew and the pistachio. Mangoes are eaten green in parts of Asia, often sprinkled with a mixture of salt and sugar. Mangoes are now grown in most tropical countries and are abundant in the northern parts of Australia. Mangoes are an excellent source of vitamin C, beta carotene and other related carotenoids. The deeper the colour of the flesh, the higher the carotenoid level. Mangoes also supply some dietary fibre.